Bushnell golf brings you the next evolution of pin seeker with jolt technology in the Tour V4.A this laser rangefinder packs an unbelievable feature set into a smaller, more ergonomically sound form factor.A the Tour V4 has the pin seeker with jolt technology you love and delivers the unrivaled accuracy you come to expect from Bushnell in a smaller and faster package.A Bushnell jolt technology provides you with short vibrating bursts to reinforce the laser is locked onto the flag. The Tour V4 is legal for tournament play and provides ranges from 5 to 1,000 yards with one yard accuracy. It provides yardages to flags from as far as 400 yards out. The 5x magnification and fast focus system help ensure you'll be able to see your target more clearly than ever before. The Tour V4 is perfect for golfers of all abilities. A carry case and battery are included. Comes with a two-year limited warranty. New in Box Bushnell Tour V4 Laser Rangefinder Patriot Pack, 201660P -- Authorized Bushnell Retailer! Bushnell Golf Tour V4 Laser Rangefinder PinSeeker w / JOLT Technology (Open Box) -- Free 1-3 Day Delivery With Hassle-free, 30-day Returns! 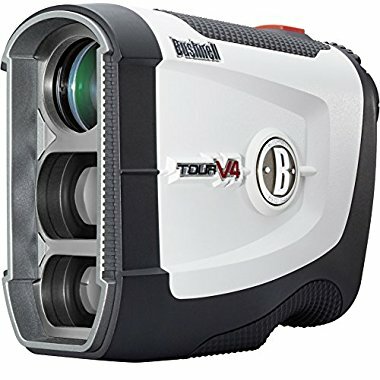 Bushnell Golf Tour V4 Laser Rangefinder PinSeeker with JOLT Technology, White -- Free 1-3 Day Delivery With Hassle-free, 30-day Returns!